Keeper of patriotism. Memorial of history. Symbol of heroes. The embodiment of folk. Cultural oasis. 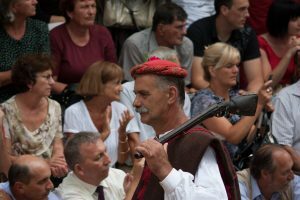 There are not enough words to describe this ceremony held in the town of Sinj, on the first Sunday in August. To bring you its meaning, we will start from the historical context without which the game would not exist. It is a knight’s tournament, Alka. 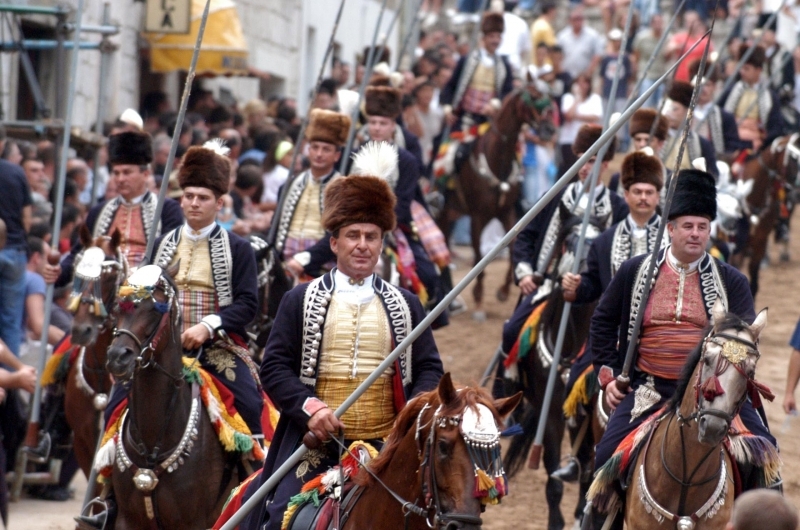 It is held to commemorate the battle of Sinj conducted within the Second Ottoman-Venetian War (1714th-1718th) between the Republic of Venice and the Ottoman Empire. In 1715 the largest Ottoman army (60,000 soldiers and 16,000 additional troops) came together with the intention to win back Sinj so they could reach other territories by the sea. With a crew of just 733 and 110 people in the Sinj fortress, they stood up for their home. The Turks demanded the surrender of the city, but the brave people of Sinj refused it. Six days later the fortress of Sinj was under artillery strikes, with the strongest attack occurring on August 14 , when the serascher-pasha Mehmed Pasha Ćelić commanded onslaught: countless pedestrians, horsemen, whom he removed from their horses to help in the attack, and subsidiary company were attacking the fort, but the defenders were quite successful in defending themselves. After extensive fighting in the night from 14 to 15 August Pasha pulled his army back to Bosnia. Yet even today it is not clear why. There are several theories: lack of food, water, artillery, discord among the Turkish soldiers, the occurrence of dysentery, approaching auxiliaries’ Venetian army. It was obvious that Pasha expected a brief and efficient siege, not thinking it would meet such high resistance. Sudden withdrawal of the enemy is a miracle that Sinj town defenders attributed to the intercession of the Mother of Mercy, to which Sinj people prayed during the battle. In her honour, they forged e a golden crown with a cross, which decorated her picture. From then, August 15 marks the Feast of Our Lady of Sinj. 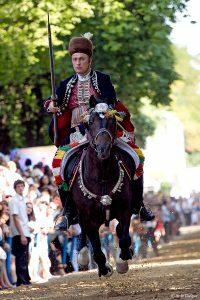 Since then they run the Alka, in which riders (alkars) on horseback, in full gallop, with a 3 meters long spear try and target a iron knocker hung on rope. The winner of the tournament is the one who in three races gathers the largest number of points. Direct hit in the central circle hoop brings three points, two points bears shot in the upper section, and hit in two subsections side bears one point. If at the end of three races alkars have the same number of points, they gallop again until the final victory. Alka Duke ties the Croatian flag, with the historical emblem on the winner’s javelin. The atmosphere in the town is quite cheerful, loud and full of coloristic folk customs such as brass band’s reveille that is played through the city from morning. Really, if you come to Croatia, Sinj holidays are the ones you don’t want to miss. 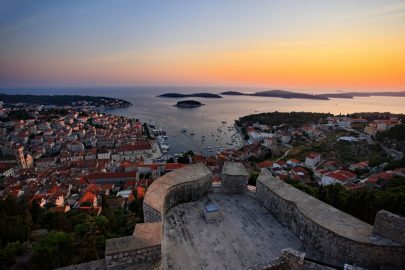 It is not an indigenous competition founded by the Knights of Sinj, but also other cities on the east coast of Adriatic hold some form of similar competition. Alka is specific because, unlike other medieval tournaments that were held occasional, Alka is based on a real event; the wondrous and magnificent defence of freedom. In addition, Alka from the beginning introduces a significant innovation: with members of the military aristocracy, immigrant and those of domestic origin, in knightly competitions can participate people from rural areas (of course, the wealthy ones), which gave the game a kind of national character. 2010 UNESCO had put Alka on the list of Intangible Cultural Heritage in Europe because it is only one from other European knights’ competition, which survived continuously for nearly three centuries, until today. Alka has its multimedia museum whose permanent display reaches a maximum of museum presentation and technological standards. 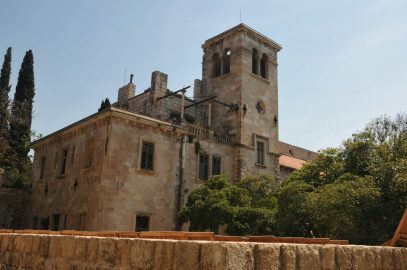 Although during its long history Alka changed time and place of holding the competition, numerous presidents, kings and state, for three centuries lasts pride and glory of the Cetina region, the memory of deceased people of Sinj in 1715 and their fighting spirit in defense of Turkish attacks. We are left to cherish those values forever.